Astronomy is unique in that the oldest, grainiest images are just as exciting and awe-inspiring as the modern. For they remind us just how far we have come in our noble effort to understand a terrifyingly immense universe. Those pesky Soviets were the first nation to place a satellite above Earth, the infamous Sputnik 1, but the US was hot on their heels when the first American satellite, Explorer 1, was catapulted into space a year later in 1958. Not long after, in 1959, Explorer 6 took the first satellite picture of Earth. The image is wholly underwhelming and looks more like a squashed fly than a monumental ball of rock, but it was a massively impressive feat nonetheless. Seemingly cobbled together out of a backyard grill and some fly swatters, the diminutive Explorer 6 boasted multifarious sensors and scanners to sniff out various forms of radiation in the upper atmosphere. These included the still-mysterious cosmic rays, which bombard us regularly with DNA-obliterating intensity—though most is thankfully blotted out by our stalwart terrestrial protectors, the atmosphere and magnetic field. Another year later, the prototypical weather satellite TIROS-1 took a much clearer picture of our beautiful, grainy planet. Our nearest major galactic companion, the hulking Andromeda Galaxy (aka M31) is about twice as large as our Milky Way. And quite amazingly, the first recognizable image of our colossal cosmic neighbor was produced way back when in 1888 by Isaac Roberts. Born in Wales in 1829, Roberts spent most of his life as a Liverpudlian businessman before consecrating himself to a more divine cause—amateur astrophotography. As this was the 19th century, astronomical devices were still crude and mostly inaccessible to working Joes like Mr. Roberts. So he built his own tools, including a 10-centimeter-aperture (20 in) telescope—now on display in South Kensington—with which he intended to catalog the stars. Using his new toy, Roberts snapped up some incredible images that no public eye had ever witnessed before, including ones of Pleiades, Orion, and the now-famous Horsehead Nebula. 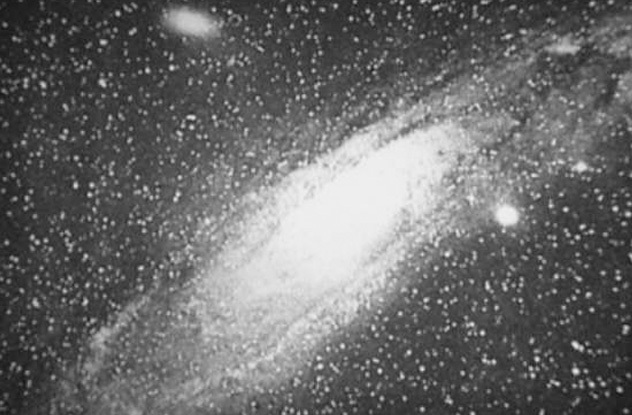 His annus mirabilis came in 1888, when he spotted what was then known as the Andromeda Nebula. Until then, no one had any idea this luminous smudge was, in fact, a whole other galaxy. In this pre-Hubble era, our view of the universe was quite constrained, and Andromeda then seemed more likely a patch of gas (or a developing solar system) within our own Milky Way rather than a cosmic islet of its own. 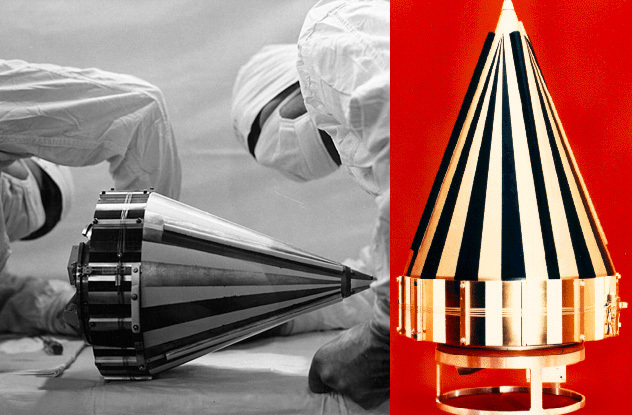 NASA officially opened its doors in 1958, and just two months later, the agency was ready to send its first, gold-plated graduates into the inky abyss. The relatively tiny (less than 60 centimeters [2 ft] in length and a measly 20 centimeters [9 in] in diameter) Pioneer 3 and 4 probes were billed as the first objects to bypass Earth’s orbit, yet only the older sibling accomplished its mission without incident. Tragically, little brother Pioneer 3 suffered a booster malfunction and was able to penetrate only 101 kilometers (63 mi) into Earth’s atmosphere. But with its trusty Geiger counter, it still managed to further science by discovering a second radiation belt around our planet, to accompany the first Van Allen radiation belt detected by Explorer 1. Shortly thereafter, in 1959, Pioneer 4 avenged its fallen comrade by becoming the first craft to escape Earth’s orbit and skim the lunar neighborhood, passing about 65,000 kilometers (40,000 mi) from our pockmarked planetary companion. The space race is no longer limited to the holy trinity of its parent countries, Germany, Russia, and the USA. The Indian Mars Orbiter Mangalyaan has recently returned some spectacular, crystal-clear images of the Red Planet. And it’s managed to do so at record cost. The stupidly cheap (by Western standards) expedition set India back only $74 million, while America’s latest Mars mission, MAVEN, cost $672 million. Or, for a different perspective, India was able to place a healthy probe around Mars for less than the cost of Hollywood’s Sandra Bullock vehicle Gravity. Why so cheap? For one, Mangalyaan (“Mars Craft”) benefited from a Hohmann transfer orbit, a time-dependent trajectory used to achieve a fuel-frugal transit. Also, at only 15 kilograms (33 lb), it was much cheaper to boot into orbit, though its small size leaves it susceptible to bullying from other Martian orbiters. The reduced cost does equal reduced capabilities, but Mangalyaan features an important methane detector. Mysterious quantities of this greenhouse gas have been observed emanating from the planet, suggesting (among many other things) the possibility of living microbes. For a while, astronauts have been growing veggies aboard the International Space Station to supplement their conventional diet of pastes and powders. 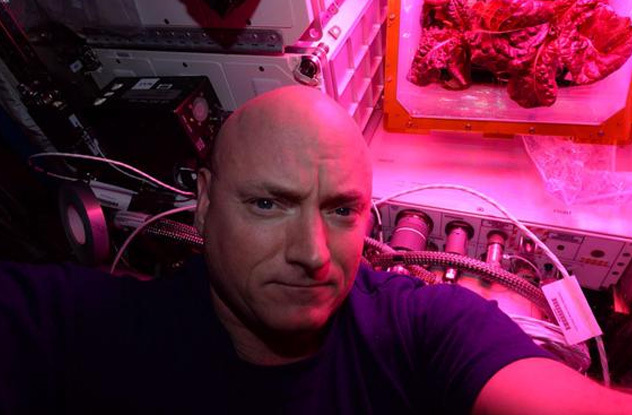 But up until now, all ISS-cultivated foodstuffs were sent back to Earth to be tested for space E. coli and other potential otherworldly contagions. In August 2015, future space travelers received an enormous boon as present space travelers were finally allowed to taste the vegetables of their horticultural labor. On Monday, August 10, Expedition 44 crew members finally consumed items grown in a microgravity environment. After cleansing the red romaine specimens with antibacterial wipes, astronauts chowed down on what they described as a tasty, arugula-like snack, one which they duly jazzed up with olive oil and balsamic vinegar to create a bona fide space salad. If the astronauts do not develop some weird space disease, then aeroponically grown crops are the best choice for long-term future eating. Not only are seeds light and therefore inexpensive to transport, but a little greenery could provide a little reminder of Earth to keep astronauts sane on their way to Mars or elsewhere. 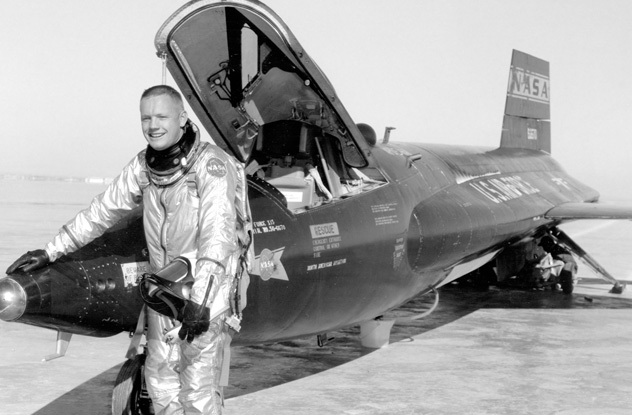 Long before he hopscotched the dusty lunar surface, Neil Armstrong helped develop the American space program by test piloting the most radically dangerous aircraft NASA could produce. Among the craziest of these experimental vehicles was the X-15 hypersonic plane. It debuted in 1959 and enjoyed 199 flights over the following decade, setting records for speed and altitude as it tiptoed the atmospheric boundary at 7,275 kilometers (4,520 mi) per hour. It was designed to test physiological and technical limits ahead of the future manned space programs Mercury, Gemini, and Apollo. And the X-15 did just that, going higher and faster than any previous craft. The rocket-powered plane consumed its fuel so voraciously that it had to be deployed midair from a B-52 and only ignited its potent engines for about two minutes. Ironically, it spent the remaining 8 to 12 minutes of its flight as powerless as a paper plane before alighting with a gentle “glide-landing.” Sadly, the hypersonic plane did claim one life: Michael J. Adams, who experienced a flight control failure on his seventh flight aboard the X-15. When the Apollo 11 astronauts returned home from their revolutionary lunar meet and greet, they were rightfully welcomed as heroes. But it wasn’t all cotton candy and puppy dogs. 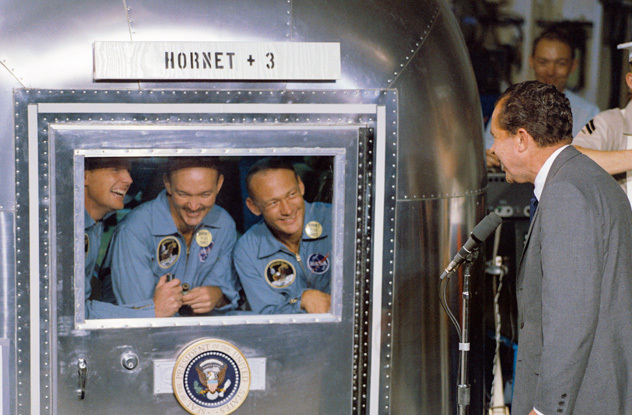 Neil, Buzz, and Michael spent their first three weeks back on Earth in quarantine. This included 88 hours inside the Mobile Quarantine Unit, a structure converted from an Airstream trailer, though it looked more like the space-age love child of a mobile home and submarine. Back in the late ’60s, the possibility of Moon microbes seemed very real. NASA had to absolutely guarantee their astronauts’ sterility before allowing them back into the terrestrial populace, and so the returning men and rocks were shacked up in claustrophobic confines to avoid cosmic cross-contamination. The unit was quite cozy and boasted a full array of amenities, including a bathroom and kitchenette. These facilities proved especially useful for the incoming Apollo 12 crew, who had the misfortune of returning on November 20 and spending Thanksgiving sequestered within the shiny capsule. Superstar astrophotographer Thierry Legault has captured the first-ever eclipse of the Moon caused by the International Space Station. From Rambouillet with love, the French Legault has compiled a montage of the ISS dashing its diagonal path across the lunar face—a super-quick transit that lasted a mere 1.7 seconds. While most of us enjoyed the most recent eclipse on September 28 from our backyards or porches, Legault worked a bit harder to capture a uniquely anthropocentric cosmic phenomenon. The Frenchman had to account for celestial distances, shifting angles, and astronomical speeds—the ISS is being slung around Earth at 25,000 kilometers (15,500 mi) per hour—to calculate a path of visibility that would allow such a spectacular image. Several computer programs and some complicated math later, voila! Oh, and this isn’t Legault’s first rodeo. Earlier in the year, in August, the legendary photographer managed to capture the very same International Space Station photobombing the Sun. And if that’s not enough, here’s another one, this time captured from Spain during a previous eclipse on March 28. On March 18, 1965, the Russians notched another W for the Soviet space program courtesy of Alexei Leonov and history’s first spacewalk. But the Americans would match Voskhod 2’s astral achievement only a couple months later when Edward Higgins White performed NASA’s first extravehicular activity (EVA) during the Gemini 4 mission. 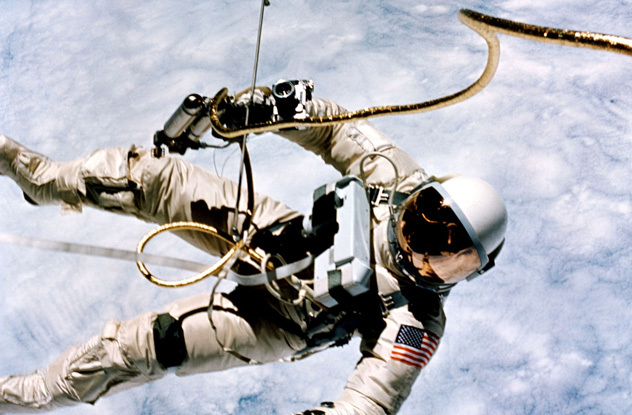 On June 3 at 7:45 PM, somewhere above Hawaii, Ed White emerged from Gemini’s tight hatch and made history as the first American to float freely through the void. White was connected to his orbiting womb by a 7-meter-long (25 ft), gold-plated tether, unaware that in space no one can see you bling. He maneuvered himself using a handheld oxygen gun and drifted along for 23 minutes, making it all the way to the Mexican Gulf before returning to the Gemini unit. Ed White was promoted to the burgeoning Apollo program but was sadly taken from us—along with fellow astronauts Gus Grissom and Roger Chaffee—while performing launchpad tests in the Apollo 1 capsule. 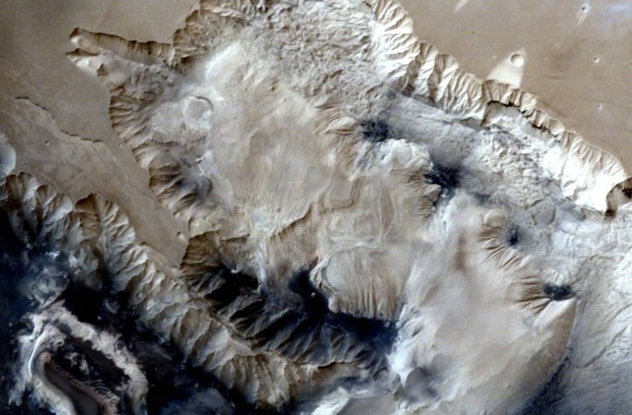 For a majority of humanity’s Moon-gazing tenure, we’ve feasted our eyes upon only one side of our satellite. Unfortunately, we can’t tidally unlock it just yet, but at least the advent of space probes allowed us to finally answer a pressing astronomical question—what does the Moon’s rear end look like? 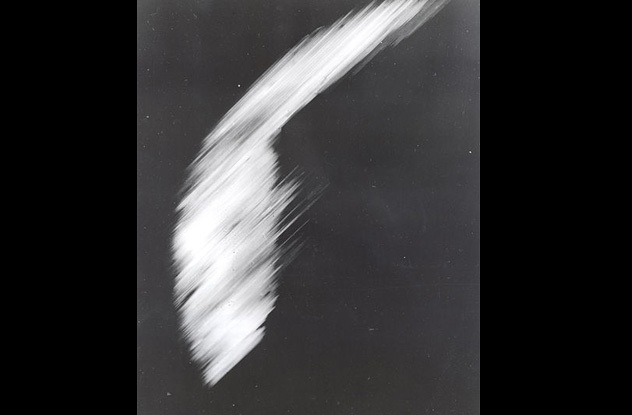 Launched from the famed Kazakh-Soviet spaceport Baikonur Cosmodrome in October 1959, Luna 3 was the third spacecraft around our satellite and the first to snap a picture of our Moon, well, mooning us. Luna 3 took a panorama of 29 shots, covering 70 percent of the lunar far side, in what was another huzzah for the Red half of the space race. 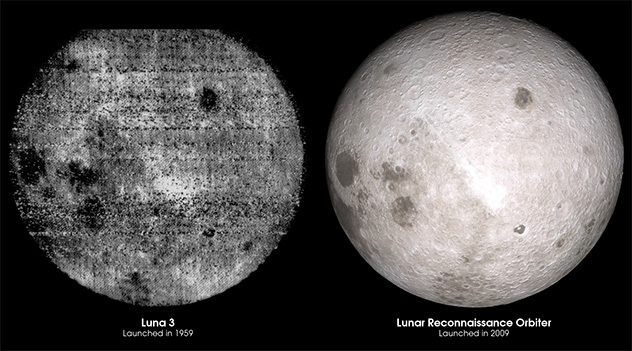 Fifty years later, NASA’s Lunar Reconnaissance Orbiter (LRO) circumnavigated the Moon and celebrated the far side’s semicentennial by recreating the same image, except in modern quality. Even though some features are recognizable across the two photos, the unprecedented detail offered by plucky little LRO shows us just how far we’ve advanced our imaging techniques.